Christmas is almost here, and everyone is getting ready. Gifts are wrapped, Christmas music is in the background, and it is time to prepare Bûche de Noël. The classic recipe is made with cream filling, and chocolate with butter cream for the outer layer. 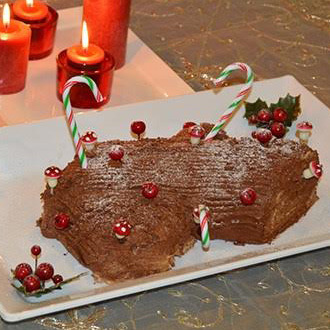 Our recipe of Bûche de Noël is tailor-made to those people who suffer from gluten allergies and dairy sensitivities. The filling is made with chestnut purée and dairy-free shortening, and the cream is prepared with dairy-free shortening too. It is a delicious recipe that the whole family can enjoy! Grease a rectangular baking sheet (25x40 cm) (use some shortening) and line it with parchment paper. Put the egg yolks in a mixing bowl, and beat using an electric mixer for 3-4 minutes. Add half the sugar gradually while beating until creamy and pale in color. Mix all the dry ingredients (flour, corn starch, cocoa, salt, and cream of tartar) in a bowl. Fold the dry ingredients into the egg yolk mixture with a spatula until well incorporated. With clean beaters, beat the egg whites while adding the other half amount of sugar until you get soft peaks. Fold in the egg whites gradually into the egg yolk mixture gently. Pour the mixture in the baking sheet and bake in the oven for 15-18 minutes. Meanwhile, spread a kitchen towel on the table and sprinkle icing sugar on it. Take the cake out from the oven, loosen sides of cake, and let it cool for 10 minutes. Invert the cake on the kitchen towel, peel the parchment paper, and roll the cake gently. Put the crème de marrons, the shortening, and the vanilla in a bowl and beat with an electric mixer, until well incorporated. Put the shortening and cocoa in a bowl. Beat with electric mixer and add the sugar gradually until it dissolves completely. Also, add the milk, one spoon at a time, until you reach a soft consistency. Put the cream in the fridge for 2 hours. Take the cream filling out from the fridge. Unroll the cake gently and remove the kitchen towel. Spread the cream filling inside the cake and roll back. Put the bûche on the serving plate. Spread the chocolate cream on the bûche and make sure it is covered from all sides. Use a fork to make lines on the glaze to make it look like a real log. Sprinkle some icing sugar to make it look like snow. Keep the Bûche in the fridge.